Have you ever found yourself wondering why some wine labels have a brand name or a grape variety on the label, while others have the name of a wine region? Does this make it difficult to decide what wine to buy? We don’t want to be wrong, after all. We want to know that the wine is a wine of quality and we want to be rewarded when we pop the cork and pour a glass. If you are new to wine, don’t worry about making the occasional purchasing mistake. We’ve all made them. The trick is learning what the label is trying to tell us about the wine inside the bottle. A lot of questions as to why some labels are more consumer-friendly than others can be summed up into the not-so-simple concept of Old World wines and New World wines. Old World wines come from Europe while New World wines come from almost any place outside of Europe. While this might explain some of the story, it is important to note that Old World wines follow a geographical model for labeling their products. In other words, the wines are labeled based on where the grapes are grown. Producers do this because these places have a history of producing wines of a typical style and quality, and quite often very specific grape varieties. New World wines label their products based on brands and grape varieties. One Old World wine region that prefers to label their wines with the grape varieties is Alsace, in Eastern France, along the German border. 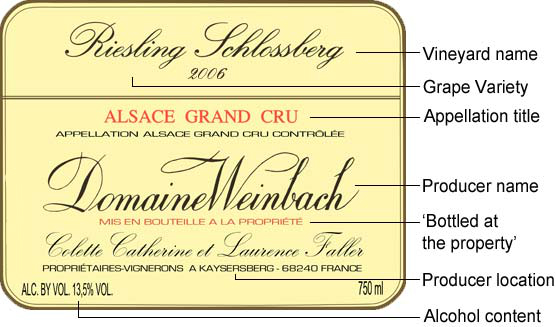 When many New World wineries were forging out on their own, they followed the Alsatian model for labeling their wines with grape varieties. The idea caught on. Today, this is the norm. Whether we are looking at Old or New World wine labels, we should be able to understand a lot about the wine inside the bottle. There will always be a vintage, the place where the grapes were grown, the alcoholic strength of the wine, the volume of wine inside the bottle, the bottler’s information, and the importer’s information (if you are buying a wine that is not made locally). 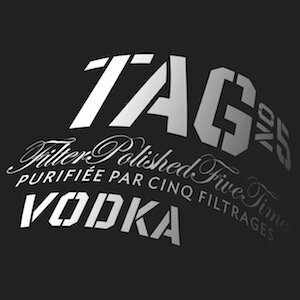 A secondary label will often include additional legal facts about the wine, which are often mandated by the local governing body that oversees the sale of alcoholic beverages. Yet, even as I generalize about these standards, some Old World wines made by savvy producers are bucking the traditions and adding the grape variety to their geographically labeled wines to help push sales. If ever you are confused after reading the label don’t be shy about asking one of the associates for assistance. If you have a personal device that can help you discover a little more about the wine, give the wine a search. While many wineries may not be able to print the grape variety on their label, most will include the information prominently on their websites. As always, I look forward to your comments or questions.